When we buy a new hard drive to store data, it can only work after partition. Are you looking for free and easy-to-use software to fix hard disk partition problems? Free partition manager, AOMEI Partition Assistant Standard, is the right one for your PC. It comes with many powerful features that you can completely control your hard disk and partition for creating, resizing, deleting, merging, splitting and more. AOMEI Partition Assistant Standard is a freeware, allows personal & commercial use and doesn’t have any 3rd party program bundled. Align Partition: Indicate the proper alignment of partition to accelerate the reading and writing speed for hard disk. Wipe Disk/Partition: Erase all the data on the disk or partition so as to prevent others to use those data by recovering. Check Partition: Find errors in file system to ensure the integrity of your data. 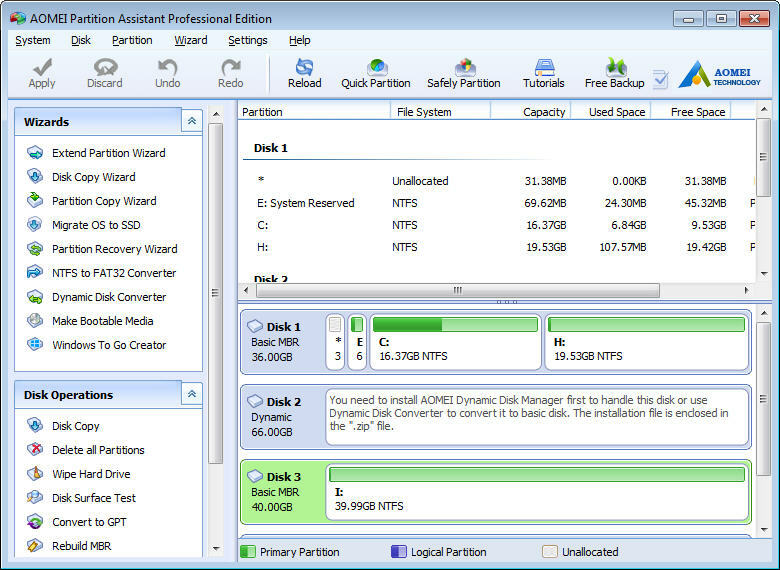 The latest AOMEI Partition Assistant 5.8 added more features. 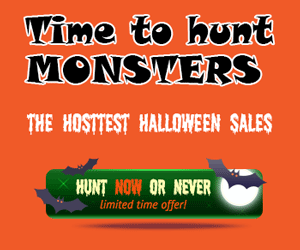 It is the only one freeware that support command lines and quick partition on the market today. Command line partitioning: AOMEI Partition Assistant provides partassist.exe utility for users to partition hard drive from command prompt like Diskpart but more powerful. You can resize/move/extend/shrink a partition without data loss from command prompt by using the partassist.exe command followed by various parameters. 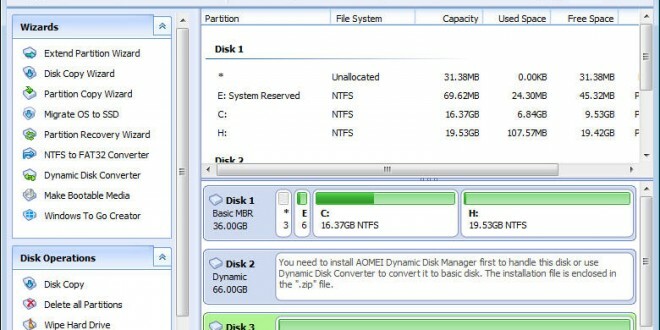 Quick Partition: Very convenient and especially designed for users who need to partition a hard drive regularly or create the same partition layout for large quantities of computers. Update: AOMEI Partition Assistant has been upgraded to 6.1. Now it supports creating second Ext2/Ext3 partition on SD cards and USB flash drives without formatting. Get The Partition Assistant Pro edition with 30% coupon code now. AOMEI PA Professional covers all functions of Standard Edition, and it can help you manage your disk and partition easier than Standard Edition do. 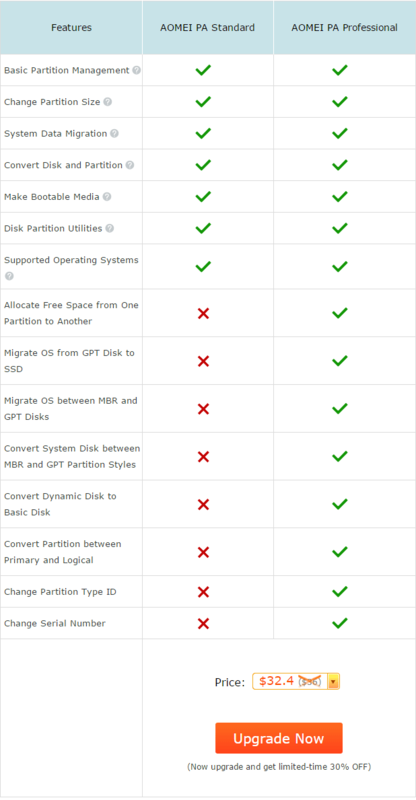 If you demand more functions to manage your partition and hard drive, you can upgrade PA Standard to PA Professional Edition (with 30% Discount code).